NASA’s Cassini spacecraft sped through a gap between Saturn and its rings for the second time Tuesday after data from the probe’s first perilous passage through the unexplored region last week found it to contain fewer potentially hazardous dust particles than expected. The finding is one of several results from Cassini’s first trip through the ring gap that has puzzled scientists. 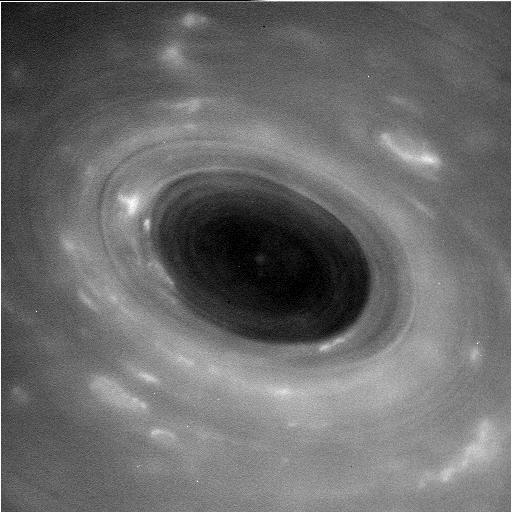 Engineers in charge of keeping Cassini safe, on the other hand, are pleased that the space between Saturn and its rings harbors fewer dangers. Cassini radioed ground controllers April 27 that it safely made the first-ever flight through the 1,500-mile (2,400-kilometer) ring gap, coming closer to Saturn than any spacecraft in history. The orbiter used its last flyby of Saturn’s largest moon Titan on April 22 to reshape its path around the planet, plunging Cassini on an orbit that will take it inside the rings once every week until Sept. 15, when it will dive into the ringed world’s hydrogen-helium atmosphere to end the mission. Cassini made its second journey inside the rings Tuesday, and mission control at JPL received confirmation from the spacecraft around 1530 GMT (11:30 a.m. EDT) that it survived the encounter. During last week’s flyby, Cassini turned to use its its 13-foot (4-meter) high-gain dish antenna as a shield to protect the spacecraft’s sensitive components, like computers and scientific instruments, from the bombardment of any microscopic dust grains in its path. Scientists crunching data captured last week said the passage produced far fewer dust impacts than predicted. Models of the dust environment suggested Cassini would sail through the ring gap unscathed, so officials were not too concerned going into the first flyby. Nevertheless, recordings of the dust strikes were quieter than scientists expected. The craft’s radio and plasma wave science instrument detected hundreds of dust hits per second when Cassini was passing just outside Saturn’s rings over the last few months, but only registered a few impacts inside the ring gap. Scientists converted the raw radio and plasma wave data into an audio format, NASA said, to listen for debris striking Cassini’s antenna. Cassini made the trip through the ring gap at a relative velocity of about 77,000 mph (124,000 kilometers per hour), fast enough to travel from New York to Los Angeles in less than two minutes. 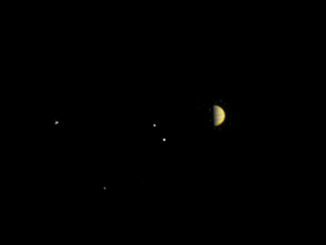 The video posted below includes the audio recording from Cassini’s radio and plasma wave science instrument during the April 26 flyby. The grains that hit Cassini were likely no bigger than a particle of smoke, or about 1 micron in size, according to NASA. 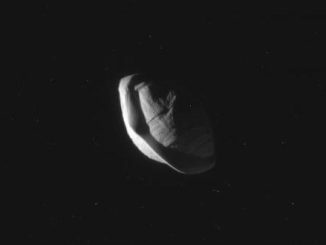 Cassini’s swing inside Saturn’s rings Tuesday occurred without using the craft’s antenna as a shield. Mission managers decided such a precaution was no longer necessary after sampling the dust during the first flyby. But four of the 20 remaining ring gap passages will place Cassini closer to the inner edge of Saturn’s D ring, where scientists expect more dust particles. 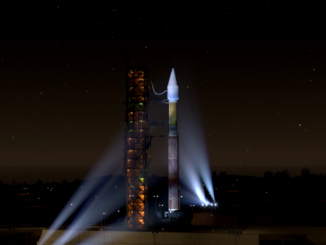 During those orbits, which begin in late May, the spacecraft will again turn its high-gain antenna into a shield. 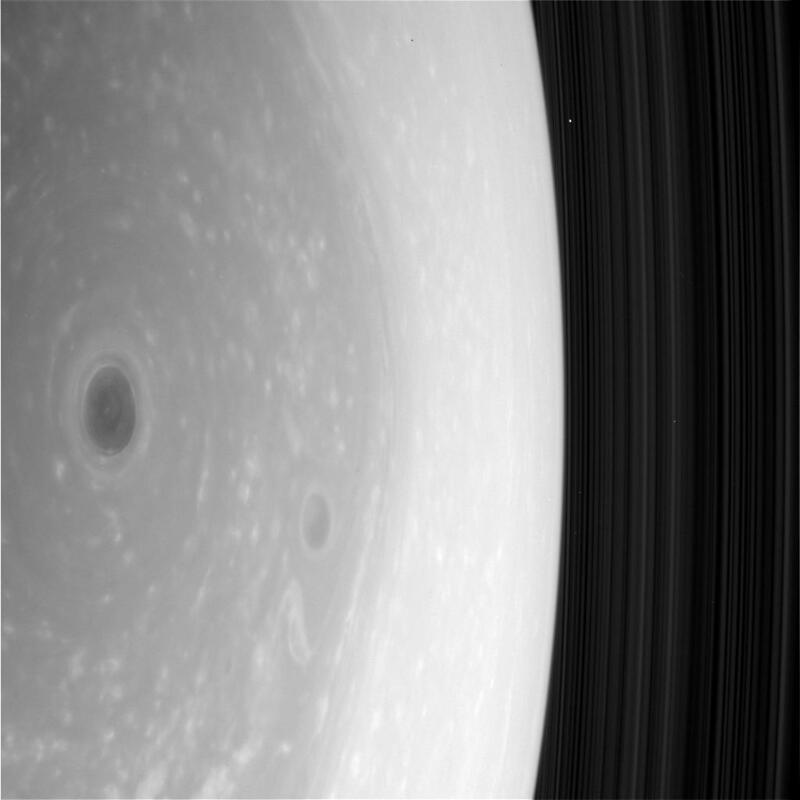 Imagery from Cassini’s approach to Saturn on April 26 revealed the closest-ever views of the planet’s clouds and a bizarre six-sided polar vortex scientists had only studied from afar before. Winds whip around the storm at up to 180 mph, or 300 kilometers per hour, Baines said. Like a hurricane on Earth, the wind speeds die down farther from the center of circulation, where individual storm clouds appear to move around Saturn in the planet’s jet stream. “Now we see structure,” Baines said. “You see the curly cues on here, all sorts of strange features that we’re trying to understand … Now we’re seeing little tiny circular clouds that really have their own individual characters. “They might (have) convective upwelling from below, so we’re looking for lightning and other things to see if we can really confirm that,” Baines said. 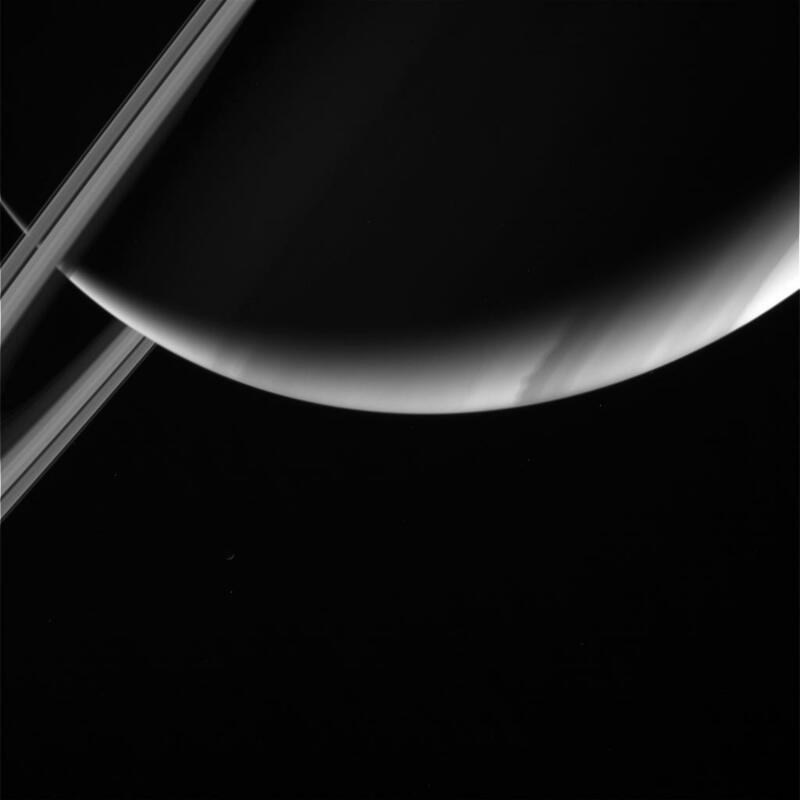 During the mission’s second orbit through the ring gap, Cassini’s cameras were programmed to take pictures of Saturn’s rings backlit by the sun, a viewing geometry that allows the instruments to see faint ringlets and other fine structures. Future encounters will focus on studying Saturn’s interior, magnetic field and taking the first measurement of the mass of the planet’s rings, which will tell scientists about their age and origin. The video posted below condenses one hour of observations into an animated movie showing a series of Cassini images taken April 26. The movie shows Cassini’s view of Saturn starting from an altitude of 45,000 miles to just 4,200 miles (72,400 kilometers to 6,700 kilometers) above the planet’s cloud tops. “The images from the first pass were great, but we were conservative with the camera settings. We plan to make updates to our observations for a similar opportunity on June 28 that we think will result in even better views,” said Andrew Ingersoll, a member of the Cassini imaging team based at Caltech.